Did you complete your undergraduate degree in an area related to sports? Or maybe you have your undergraduate degree in a business related field. Either way, are you finding that you do not have the professional opportunities that you had hoped your bachelor's degree would make available? 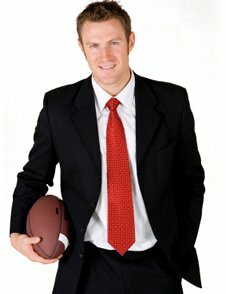 Are you now considering obtaining your Sports Management MBA degree? This is a great career decision since it will open up professions such as public relations, account management, sales, marketing, coaching, and athletics. What's even better is that with an online learning format it is completely possible for you to pursue this degree program while maintaining your current lifestyle or your current employment situation. However, you should be aware that this type of instructional format will require you to be very self-disciplined, so you will want to be sure that you have done your homework regarding this type of learning situation. Ultimately, you should choose a college or university to attend based on your schedule, the location of the school, and your career dreams. Although the particular curriculum will surely vary some from one learning institution to another you can expect to be required to take courses related to accounting, entertainment industry finance, psychology, business law, public relations, legal aspects of sports management, business administration, finance, sponsorships, sports management and operations, tactics of deal making and negotiations, and marketing. In order for you to be successful in this career path it will be important that you have great communication skills, that you have a solid foundation for how a business works, that you can negotiate with the best of them, that you can handle the public relations aspect of the occupation, and that you are generally a good salesperson. If you are not already aware, this career field has extremely fierce competition for job seekers. Therefore, it is critical that you have a strong skills set and adequate knowledge that can be exhibited to potential employers. A Sports Management MBA program will make it possible for you to work within the business aspect of professional athletics. For instance, you may work with regards to ticket sales, to marketing specific athletes or professional teams, to monitoring an athlete's finances or a team's finances, within public relations, as a sports agent, or by negotiating an athlete's contracts. Essentially, you will be adequately trained to seek employment anywhere professional athletes and professional athletic teams are found. One of the professions you could pursue is a sports marketer. In this capacity you would be helping semi-professional or professional sports teams create new means of revenue, maximizing the resources that they have, and properly maintaining their sports facilities. In this occupation you may also be responsible for providing customer service, helping a team better build their brand, and working to enhance events for the public and ticket sales. While an undergraduate degree may allow you to work at an entry-level position related to this field, your MBA degree will definitely allow you to have additional responsibilities. Another possible career path is for you to work as a venue or stadium manager. In this capacity you would be responsible for supervising the day to day operations of a stadium or a particular venue. This would include a stadium's repairs, finances, new construction plans, maintenance issues, and overall business administration. Although in your job position you will spend the majority of your time working with football or baseball teams, during off seasons you will still be responsible for the stadium or venue. It would be common for you to secure events or other promotions to provide a consistent income for the stadium.